CONDÉ NAST has announced it is going into partnership with Amazon. The Internet retailer will handle print and digital subscriptions for Condé Nast’s stable of glossy titles such as Vogue, Wired and Vanity Fair. 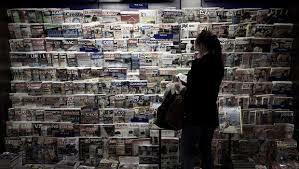 Consumers will be able to buy, manage and renew their magazine subscriptions under a new “all access” plan for both print and digital editions using their Amazon account. It is hoped the move will give readers more choices and encourage higher subscription rates as well as giving the publisher access to Amazon’s customers currently around 200million. Digital subscriptions will be made available on several mobile platforms including the Kindle Fire, iPad and Google’s Android tablets and phones. Readers will still be able to get their subscriptions from the publisher or to its other partners including Apple Inc. Condé Nast will offer introductory bundled rates for $6 or less for six months for both print and digital versions of Vogue, Glamour, Bon Appetit, Lucky, Golf Digest, Vanity Fair and Wired. It plans to roll out its other 11 consumer titles including the New Yorker later in the year. Conde Nast’s total circulation, including print and digital, is about 18.5 million copies, according to the Alliance for Audited Media. About 4 per cent of its total subscriber base is digital. This entry was posted in News and tagged Amazon, Conde Nast, digital magazine sales, Vogue, Wired. Bookmark the permalink.